The first missionary to arrive in Japan to spread Christianity is believed to have been Francis Xavier, who arrived in 1549. There are records of him visiting the capital, Kyoto, in 1550 and departing by ship from Toba Port in Fushimi (now Shimo-Toba, Fushimi-ku, Kyoto City) when leaving the capital. Following Xavier, Christianity gradually spread around Japan, and the Azuchi-Momoyama period “Christian Daimyo,” Takayama Ukon, is known as one of its main driving forces. Takayama Ukon was born in 1552, in Takayama in the province of Settsu (now Toyono District, Osaka Prefecture), and served both Oda Nobunaga and Toyotomi Hideyoshi as a warrior during the Warring States period. While he was lord of Takatsuki Castle, he also fostered a faith in Christianity, and proselytized to daimyo close to him, including Kuroda Kanbei and Gamo Ujisato. The unwavering faith that Takayama Ukon fostered penetrated deep into peoples' hearts. However, the country's rulers were wary of faith in a foreign religion. After Toyotomi Hideyoshi's 1587 order to expel missionaries from Japan, Takayama Ukon found refuge as a “guest general” under the protection of the Maeda family, lords of Kaga Domain. 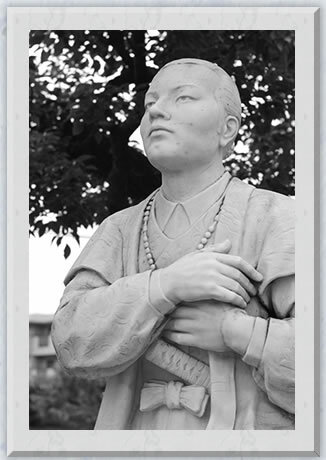 However, with the Tokugawa Shogunate's 1614 general prohibition on Christianity, he was forced to flee Japan, finding a home in Manila in the Philippines, where he died in 1615. Statue of Takayama Ukon (Catholic Takatsuki Church) holding a rosary to his chest. This statue is noted for showing his deep, unwavering faith. Fushimi, Kyoto, is not usually seen as a place connected with Takayama Ukon. Fushimi was a center of politics from Hideyoshi's era to that of the third Tokugawa shogun, considered to be a politically important site as a sort of “capital,” and the castle town of Fushimi was filled with mansions built by the lords of Japan to show their submission. We can see how Ukon's footprints have been imprinted on the soil of Fushimi through historical records. The way that the lane leading to the Fushimi Jesuit Church (1604-1614) Ukon was involved with was secretly maintained was confirmed by Gekkeikan, which owns the land, in 2015. In January 2016, the Vatican announced that Takayama Ukon has been approved to be beatified. The status of "blessed" is the stage below being canonized. The name of Takayama Ukon will now be known throughout the Catholic Church and the world, honoring his faith. Mitsumata Shunji, “Fushimi Kirishitan Shiseki Kenkyu” (A Study of the Historic Sites of Fushimi Christians), Kyoto Seibo College Fushimi Studies Society, ed. Fushimi no Rekishi to Bunka (History and Culture of Fushimi) (Kyo/Fushimi Monographs Collection 1), Seibundo, 2003. Ebisawa Arimichi, Takayama Ukon (Biography Monographs) [New Edition], Yoshikawa Kobunkan, 2009. Shimazaki Kenji, Kirishitan Daimyo Takayama Ukon no Ashiato o Aruku - Yukari no chi shashin-shu (Walking in the Footsteps of the Christian Daimyo Takayama Ukon: Photo album of places connected with him), Sangaku Publishing, 2014. Nakanishi Yuki, ed., Takayama Ukon Kirishitan Daimyo e no Shin Shiten (Christian Daimyo Takayama Ukon: A new perspective), Miyaobi Publishing, 2014. Hubert Cieslik, Takayama Ukon Shiwa (Historical Stories of Takayama Ukon), Seibo Bunko, 2012. Furusu Kaoru (supervised by the Special Committee for Promoting Canonization and Beatification, Catholic Bishops' Conference of Japan), Yusuto Takayama Ukon - Ima, Orite Iku Hito e (Justo Takayama Ukon: To those who abandon ambition), Don Bosco Sha, 2014. The designs used in this corner include images photographed by Gekkeikan with the permission of the Catholic Takatsuki Church (2-26 Nomi-cho, Takatsuki City, Osaka).